Do you have a special talent to make easy money online? Do you know how to write an effective business plan? Or are you a specialist in software tools? Maybe you are even a genius at maths and don‘t have to struggle to find the answers to complex problems. All of us has at least one special skill or some specific knowledge that could be used to create a lucrative online business. Even a really attractive smile or a melodiuos voice could be your chance to improve your monthly income. You don’t believe this? Just keep on reading. Surely you have skills that help you generate additional funds. However, you might also have some skills that could make you thousands of euros a month. Using your special skills could be the first step of building your own business. Working at your own pace means: Work wherever you like. Work whenever you want. Do whatever you like. Now you might start thinking about creating your own website. But what if you don’t even need one? What if you could use your skills and knowledge and turn them into a product that you could sell to people online without the need of a website? This post shows you the best 3 opportunities. Our first recommendation: eBooks. If there is a possiblity of sharing your knowledge as an expert in the shape of an eBook you should definitely start with that. We are living in the age of communication technology. 80% of the users of search engines seek information. They want to know how to build a chicken coop or where the best spots for summer holidays are. People look for answers to their questions. They really appreciate the work others have done for them by gathering information and presenting them in an eBook. What springs to mind when you start thinking about eBooks…? Of course… Amazon. When you upload your eBook to one of the most successful online market places in the world there are a lot of advantages. Firstly, Amazon’s eBook reader, Kindle, is an established and popular product in the niche market of eBooks. Secondly, because it is a global product you gain access to a huge target group. After setting the price for your product your return on investment (ROI) depends on the success of your eBook (the tantieme model). The best case scenario would be a 70% ROI. Most people know this business model and you defenitely should use it, but we would like to talk about something else. The platforms that we are going to present are similar to Amazon. However, they offer you different options to help boost your income. 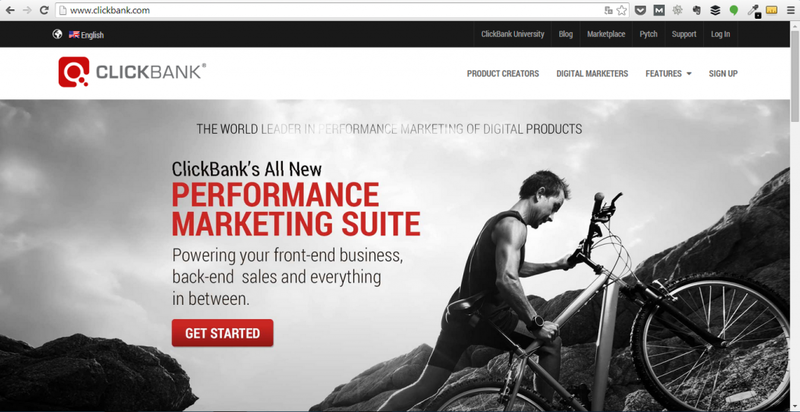 Have you ever heard of ClickBank? ClickBank was one of the first players in the performance based markets places. It is a network that connects vendors with affiliates to promote their eBooks and other digital products. Then the affiliates choose a product to promote through their distribution channels. Their aim is to lead people to their own website so that they buy one of the products the affiliate is promoting. The bottom line is that you are not responsible for promoting your own product. Platforms such as ClickBank provide you with useful services, e.g. secure payment transactions between vendors and affiliates. That is why the company gets comission for each sale. However, ClickBank’s most attractive advantage is the huge global network of affiliates seeking products to promote on their own website. In return you share your earnings, in the form of a comission, with the affiliates. ClickBank started up in 1998 in the United States, which is why the online market can offer a lot more products for people from English speaking countries than from anywhere else. This target group can choose from hundred of thousands of products to buy or to promote. DIGIbux, Zanox, Affilinet, Digistore 24 and AdButler. Now you know that writing your own eBook can give you a reasonable income. What if writing is not one of your strengths? Do you prefer to speak about your subject or show first-hand what you are talking about? Of course this works best in a video. Turn your workplace into a classroom and share your kowledge with more than 4 million users on Udemy. Udemy is the biggest learning platform on the internet offering more than 20,000 different online courses. You can upload your digital media as video and audio files or PowerPoint presentations and offer them as a learning course to more than 4 million registered users. From students who want to learn Spanish to managers who would like to improve their skills in Online Marketing, Udemy covers any topic. Initially the platform became popular in English speaking countries. However, due to its growing success, Udemy started to offer their services in more than 10 languages in the past year. Starting out is quite easy: Create a video in which you give a lecture on your field of expertise. Make sure the course takes at least 30 minutes and contains about 60% video content. To attract more students include different types of content in your lecture. Why not add exclusive material for further reading? This differentiates you from others who solely offer video content. The second step is to come up with a fair price for your course. While some lecturers take between $10 and $30 per hour, the majority offers their lectures for $30 to $100. As the user will have unlimited access to your course take your time to decide on the value of your knowledge. After you upload your video Udemy will check it against their quality standards. The major strengths of Udemy lies in its Marketing. Price reductions, gift coupons and the company’s own affiliate programme all help to enhance the demand for your lecture. You can either create your own gift coupons on Udemy and spread them on the Internet or place price reductions on selected platforms. As we explained ClickBank earlier in this post, you already know how affiliate programmes work. Paying comission to the affiliates on Udemy is one way to increase the number of students on your course. For instance, if a student has some trouble downloading your course the Udemy support team will help out. As you can see, your input of time is relatively low. Fernando Rodriguez, from Madrid, made about $32,000 in two months with a Spanish speaking course in programming iOS. A Portuguese man, Victor Bastos, earned nearly half a million dollars with lectures about web development in one and a half years. He saw the potential of online learning and turned his business on Udemy into his full-time job. Even though the German speaking market is relatively small in comparison, lecturers have shown that you can be successful. Focusing on courses about street photography, Thomas Leuthard, is one of the best earning lecturers in Germany. With more than 700 registered students he made $10,000 in three months. 96% of the lecturers make sales, however, the majority cannot live from their earnings on Udemy. Income varies from a few hundred up to several thousand dollars per month. Extra tip: Those who promote their videos on Social Media are the most successful. But don’t think that Udemy is only for experienced lecturers. Just recently a young American had his breakthrough. Inspired by the book “The four-hour week” by Tim Ferris he decided to strive for a career where he can be his own boss and work whenever he likes. When Apple announced the implementation of the programming language “swift”, Nick Walter came up with the idea to create a tutorial on how to handle this new program. Within four days he made 50 short videos and uploaded them on Udemy with free access for the first 24 hours. On the first day 1,600 people registered for his lectures. After changing the price to $199 per course he earned $40,000 in 30 days. This is the monthly salary for a top manager but as you can see, it can become a reality with Udemy. However, Nick Walter’s dream of making money is not over yet. Only due to Udemy’s advertising, a monthly income of $3,000 to $5,000 was guaranteed. And the story did not end there. Since users found his videos extremly helpful he decided to create a marketing video with which he made $66,000 in one month. Here we go, Nick Walter proves that you can be successful. Udemy is not the only platform to educate yourself online. As well as Khan Academy, Coursera, Lynda.com, Udacity, Pathwright, StraighterLine and Course Hero there are even more competitors in this market. However, Udemy is the only platform that does not specialise in a certain area and where anyone can become a lecturer. Moreover, thanks to the high number of users Udemy is certainly the most profitable platform. As Udemy is still in its early stages of growth, there is a huge potential for your online business. Because of its hugh variety Fiverr attracts creatives, designers, online marketers and young business people who sell their talent. Conduct some research on this website and you will find offers from love promises to perfect business plans – funny and creative products for everybody. Since its foundation in 2010 the company has already been transformed into a fabulous online market. Users can access more than 3 million gigs – this is what Fiverr calls its products and services – from 200 different countries. Fiverr’s user base has increased incredibly fast. Considering its search volume Fiverr became one of the Top 100 websites in the USA and was ranked in the top 150 websites worldwide. It doesn’t matter whether you seek products for your private use or your business. Fiverr gets whatever you need done. You can choose the offer, from a pool of different services on the website, that suits you best. Signing up for a Fiverr account only requires an email and a password and you are ready to start your online business. The price for one gig varies between $5 and $150, however, the majority of the goods and services offered in this market place are sold for a very attractive amount of $5. You may think that these low revenues won’t make you rich and you are right. But still, there are creatives offering their ideas on this platform who have already earned $1,000 with one single sale. Important advice: Make sure that the product or service you offer can be easily executed by yourself. You won’t increase your ROI if it takes to much time to satisfy the needs of your customer. You must be fast, but effective, to make money. Fiverr receives a 20% comission from every sale of your product, so you only earn $4 for your efforts. After achieving a certain level of sales and good reviews, Fiverr offers you the opportunity to increase the price of your products. 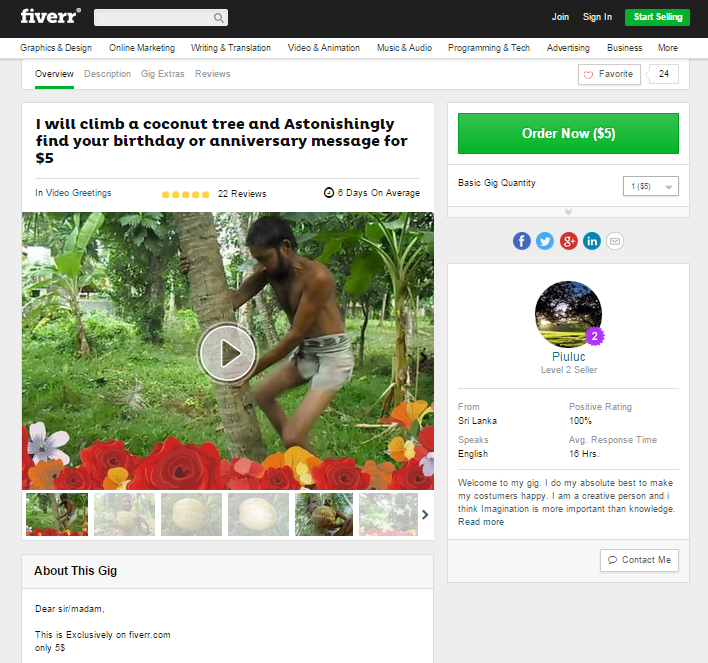 Idea: Here is one of many creative expamles of how to make money on Fiverr. Even people living in the jungle use Fiver for easy money online. Don’t think too much, just do it. A 15 year old boy was looking for some leisure time activity. He found Fiverr. Going along with his strengths he started to fake WhatsApp messages. Apart from having fun by doing what he is good at he is also increasing his pocket money. Fiverr’s terms and conditions allow people who are 13 and older to participate in its website. This boy is not the only one who is still in school and earns money on Fiverr. Morissa Schwartz, a college student from the USA, was so smart that she was able to finance her studies with Fiverr. She offered lessons in singing and gave people active help in writing content. For 3 to 4 hours of work during the day she was able to earn $7,500 a year. Schwartz saw her business on Fiverr more as a training for her future profession than as a job. The guy who generated the biggest revenue with Fiverr also comes from the USA. Mark Mason sold enough of his digital products to buy a house in Indiana. His profession was email marketing newsletters. Working 3 to 4 hours daily he earned betweeen $150 and $300 every day. What is the secret behind the success? With the creation of the so called “Gig Economy” Fiverr created a new platform where users are able to turn their talents into a business. People looking for a way to make easy money online with their creativity, and those who want to get things done cheaply, are excited about the novel concept of Fiverr. Thanks to the low-cost strategy the number of sales increases constantly. Word of mouth as well as diverse online media channels are the reason for the success – not only for Fiverr, but also for you. You don’t expect much when you buy something for only $5, however, the majority of customers praise the good value they get for the money spent. Even if you don’t receive what you expected, you cannot be too disappointed because you only paid $5. “Alemania te necesita” is our Spanish website where we offer information for unemployed people on taking on a job in Germany. The logo was created by an Indian guy on Fiverr. The price: $5. Now, we will reveal how to make money with your smile. 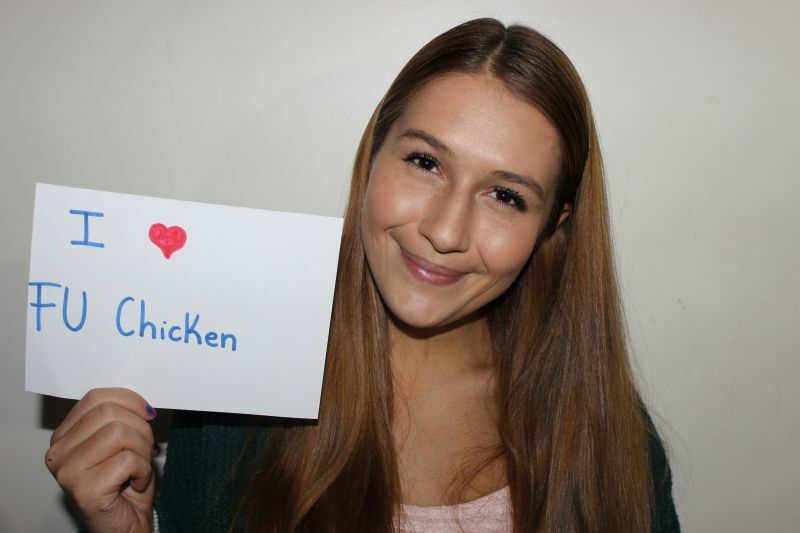 We decided to promote the delicious chicken sandwich – the so called FU Chicken – that you can eat in our cafeteria. By looking for the perfect picture for our advertisement campaign we checked out the offers on Fiverr as well. We decided to give it a try and received five different high quality pictures. These pictures show a happy smile and a short handwritten note. What is the right platform for you? You have learnt about the three best ways to make money online without having a website. You have probably already came up with a few ideas for your own business. You have discovered the possibilites of each online market such as ClickBank, Udemy and Fiverr. Now it is up to you to decide which platform works best for your skills. Why don’t you start with your small or even big business today?